WASHINGTON – When Russian bombers approach American airspace and U.S. Air Force fighters are scrambled, Sarah Palin‘s phone doesn’t ring. The Alaska governor has no command authority over the guardians of U.S. airspace despite her recent suggestion otherwise. “She doesn’t have any role in that process,” Air Force Maj. Allen Herritage, spokesman for the Alaska North American Aerospace Defense Command, told the Daily News. “The authority to launch and respond to a Russian incursion lies with the Alaska NORAD Region commander” – Air Force Lt. Gen. Dana Atkins, he said. Palin said last week that her foreign policy experience includes facing the Russians. “It’s very important when you consider even national security issues with Russia, as Putin rears his head and comes into the airspace of the United States of America – where do they go? It’s Alaska,” Palin told CBS‘ Katie Couric. “It is from Alaska that we send those out to make sure that an eye is being kept on this very powerful nation,” she said. Moscow‘s bombers have skirted Alaskan airspace 20 times, thugh they have not violated it, during Palin’s governorship, officials said. When F-15 and F-22 interceptors scrambled from Elmendorf Air Force Base in Anchorage in response, John McCain‘s running mate was not speed-dialed with the news. “The commander does not call the governor,” Herritage said. Steven Biegun, a McCain foreign policy adviser, said Palin is informed of the fly-bys by her National Guard commander. The Alaska Air Guard, which Palin oversees, performs airspace-watching missions only under NORAD command, and does not fly interception sorties. Palin did get an annual Air Force briefing in February. 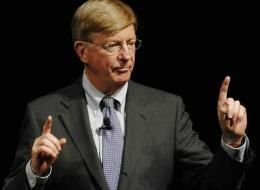 Famed conservative columnist George Will told a gathering of Senate aides on Monday that Gov. Sarah Palin is “obviously” not prepared to assume the presidency if necessary, two event attendees told the Huffington Post. Appearing at a Senate Press Secretaries Association reception at the Cornerstone Government Affairs office, Will offered a harsh assessment of John McCain’s running mate. Will did state, according to a second source, that Palin has received rough treatment from the media; arguing that the Alaska Governor would have been “skewered” by the press if she had made some of the same gaffes as Sen. Joe Biden has in recent weeks. But his sympathies only extended so far. Will has already been critical of the other half of the Republican ticket, calling McCain’s handling of the financial crisis “un-presidential” just one week ago. And in offering his take on Palin, the longtime Washington scribe becomes the latest in a list of respected Republican officials who have now soured on the Palin pick. Last week, Kathleen Parker of the National Review penned a column calling on the Alaska Governor to be dropped from the ticket. New York Time’s columnist David Brooks and former Bush speechwriter David Frum have also expressed their doubts about Palin’s capacity for the vice presidential post. It seems that at least one independent witness in the Troopergate investigation has changed her tune once she was sworn under oath. Murlene Wilkens, the private contractor hired to manage Workmens’ Compensation claims for the State of Alaska at first released statements that no pressure was put on her in the case of Trooper Wooten, Sarah Palin’s ex-brother-in-law. it appears that Wilkens’ story under oath suddenly changed, and after seeing hard evidence, including sworn testimony of one of her own employees, she admits to denying Trooper Wooten’s previously approved claim at the direct request of Sarah and Todd Palin. Much more to Sarah Palin’s abuse of power and her vendetta against the ex-brother-in-law is beginning to surface. And of course, goon-husband Todd is right in the middle of it. Hugo Chavez is the leader of Venezuela, a country located in South America. Read more about McCain thinking Spain was in Latin America here and here. Bush, Bernanke and Paulson Are Hyping the Crisis ?